From a botanical standpoint, cannabis is an incredibly interesting plant that has adapted over the centuries to have a variety of uses. There are thousands of different variations in cannabis, creating what are referred to as strains. These strains have different flavours, aromas, growing attributes, and each one possesses a different makeup of chemical compounds. 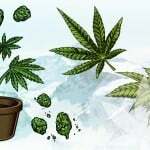 Don't worry if the thought of thousands of slightly different strains and their individual nuances sounds overwhelming. By taking a step back from the broad spectrum of cannabis strains, we can simplify matters and group these strains into three species: sativa, indica, and ruderalis. A quick note: The scientific classification of cannabis is disputed. While the original classification defines only one species—Cannabis sativa—modern researchers and experts now recognise three distinct species C. sativa, C. indica, and C. ruderalis. Showing a preference for warmer climates, the uninterrupted sunlight these environments offer empowers C. sativa to grow tall, quickly reaching over two metres in height. It also produces more leaves than its indica counterpart. Chemically, sativas also show the greatest variation in cannabinoids, the chemical compounds within cannabis. They can feature both high and low concentrations of THC and CBD. The former is the psychoactive cannabinoid commonly associated with cannabis, while the latter is non-psychoactive. If C. sativa is tall and skinny, then C. indica is the short and stocky alternative. Originating in the mountainous regions of Pakistan and Afghanistan, this kind of plant has adapted to colder, harsher temperatures. As we have alluded to, the structure of C. indica is much shorter, growing bushy with thicker and fewer leaves than C. sativa. Because of the colder climates, they have also evolved to have a shorter flowering time. THC concentration in C. indica is usually higher than in C. sativa, although the cannabinoid CBD is still present. Often considered the middle ground of cannabis species, C. ruderalis shares similarities with both C. sativa and C. indica. Depending on the specific genetic heritage of a ruderalis strain, particular traits will have a stronger presence than others. C. ruderalis is much hardier than the other species as it’s used to growing in less than ideal environments in Central Asia. C. ruderalis plants won’t grow very large, however, the most significant difference is how they flower. This species is not triggered by light cycles, instead plants will bloom after a predefined period—regardless of light exposure. Being a jack of all trades, it also features a mix of cannabinoids. Across the ruderalis species, THC concentration is nearly always very low, while levels of CBD peak in certain strains. An visual representation of the chemical compounds within C. sativa, C. indica, and C. ruderalis is shown below. Consider it a general rule when reviewing the concentration of chemical compounds each species develops. The prefix “Cannabis” simply refers to the genus that all three species originate from. We can further segregate cannabis by splitting it into several primary categories: hemp, marijuana, industrial hemp, medical cannabis, and cannabis hybrids. Each class incorporates one or several combinations of the species listed above. Hemp is a specific strain of Cannabis sativa that contains almost nonexistent levels of THC and high levels of CBD. Marijuana, on the other hand, is the broad term given to cannabis strains that feature high amounts of THC along with several other prominent cannabinoids. Most individuals will be familiar with hemp. It has been grown for centuries, with the earliest cultivation dating back to 8000 BCE. It has provided humankind with clothes, paper, rope, nutrition via the seeds, animal feed, and biodegradable plastics to name but a few uses. Unfortunately, it is hemp’s similarity in genetic structure to psychoactive marijuana that has caused this environmentally friendly and diverse strain to fall in and out of favour with government institutions. Reassuringly, hemp cultivation is back on the rise as we have come to understand more specific details about its chemical compounds. The lack of tetrahydrocannabinol (THC) means hemp does not possess any psychoactive properties. It is, however, naturally high in CBD. Hemp can cleanse damaged soil, is a rich source of healthy omega-3 fatty acids, and provides strong, recyclable fibres for many commercial sectors. Hemp is a rich and rewarding plant that will undoubtedly play a part in the sustainability of future industries. Marijuana encompasses all three types of species above. Further diversification includes the possibility for plants to be male, female, or intersex. A male plant releases pollen to fertilise a female plant, which then produces seeds. Marijuana contains substantial concentrations of THC and is commonly known for its psychoactive side effects. Industrial hemp is hemp grown on large scale to support any one of the uses we listed above. Fast growing rate, high yield, and an affinity for being raised close together make hemp plants incredibly viable for commercial operations. Just like any other commercial industry, regulations apply. In this case, industrial hemp has to include less than 0.3% THC to be legal to sell. Depending on a country's specific ruling, that percentage can fluctuate slightly, but never by more than a fraction. The concentration of THC in industrial hemp will always be low enough that there are no psychoactive side effects. Much like natural hemp, the CBD concentration is still high. Subject to rigorous testing and government regulation, medical cannabis refers to cannabis and cannabinoids that have been recommended to patients by their doctors. Medical cannabis can be prescribed for a variety of ailments, however, the legality of medical cannabis differs vastly across the globe. Cannabis used medicinally can be rich in THC, CBD, or a combination of the two. The specific strains or species used for medical cannabis will depend on the treatment recommendation made by the doctor. In essence, any cannabis could be used for medical treatment as long as it has passed the required testing and comes from a certified supplier. Lastly, we have cannabis hybrids, and you guessed it, they are a combination of sativa, indica, and ruderalis genetics. It is possible with careful selection and expert cultivation techniques to cross different species. The aim is to create a cannabis strain that has a collection of desirable attributes from whichever species are being crossed. Hybrids feature heavily in the marijuana industry, as growers try to create unique combinations of flavour and aroma. Hybrids can also be bred to contain higher concentrations of particular cannabinoids. Visual indicators like height or leaf spacing can suggest which genetics are dominant in fully mature cannabis plants.